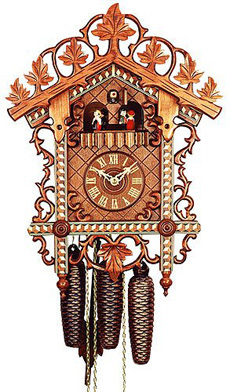 Traditional carved 22 3/4 inch 8 day cuckoo clock by Hekas. First time ever for a clock to feature an automatic night shutoff in this price level (usually you find an automatic shutoff in musical 8 day clocks priced above $1000) . The automatic shutoff will silence the clock at nighttime without the need to manually turn it on or off. 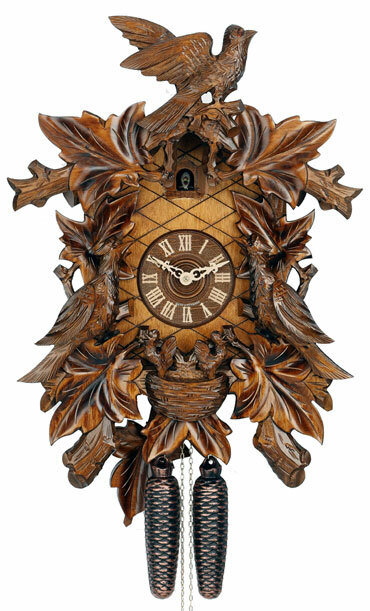 Clock features extra deep carving of birds and leaves.Wooden dial, hand, cuckoo bird and crossed front compliment the overall look of this nicely carved cuckoo clock.